With the growing popularity of bars in kitchens and game rooms, LodgeCraft offers a large variety of bar stools. Our selection of rustic bar stools is one of the most comprehensive collections online including stationary and swivel designs with leather, cloth, wood or cane seats. Imagine how quaint a log stool would look at your counter or bar, perfectly accenting your existing home décor. We have multiple options available as bistro tables and sets, and you can mix tops and bases to suit your specific decor. 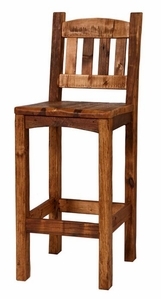 Our goal is to provide you with the best rustic or mountain modern bar stool selections online. Choose from a variety of styles, including log bar stools, mission, and rustic cabin bar stools, with a great selection of wood types and finish options, including hickory, reclaimed wood, and log stools. Ask for the 24" counter or 30" bar height. Both Montana locations feature many additional styles of bar stools in our showrooms.